Lessons Learned From Break TIme With the Girls, In a MixxedFit World! You can meet some of the most interesting, creative women at the gym. There is just something Sisterly about meeting women, in spaces of work-out and re-creation. It’s like coming together in a shared journey, of getting healthy and getting. . .FIT! It’s one of those girl time, down times, where women can provide a supportive environment. Catching up on the latest news; acquiring advice on our personal lives; and just enjoying the comforts and pleasantries of being around happy and fun-Spirited women. An informal therapy in it’s own right. It’s that perfect time when you can get away from work, family, and personal responsibilities. Just a touch of feminine. . .down time. So, on September 24, 2018, during Global MixxedFit Trainer, Ryan Grovey’s first instructor training in Cairo, Egypt, I met my own core of Special Ladies of down time, at the gym. Our initial energy took place, during the actual training. My special group of ladies came up to me. They were lively, enthusiastic, and colorful in their persona. They were a rainbow of nations, and they had come as enchanting guests-seeking comfort (and vitality), in one sector of Black America’s garden. One of those perks of being a daughter and maiden of Black America, is seeing how one’s cultural and musical forms, have traveled all over the world. Leading us blackened flowers of American soiling to other nations, we witness how our culture is performed and embraced, by other other cultures. For us working maidens, we see how our culture and music has brought the world together. A true performance of healing and peace on Earth. Even further is how, as Black American maidens, our culture leads us into interacting, and experiencing the beauty (and aesthetics) of different nations and cultures of women. And, it was right there, at Steel Fitness Gym, where colorful Maidens (and Mothers) from Russia, Ukraine, South Sudan, and Egypt (both Cairo and Alexandria) had entered into my cultural garden. Diverse and versatile, as an euphoric flower garden, I felt pleased (and honored) to have been in their company. And yes, those women-appreciating gents made their presence, as well! One of the fascinating Beauties of being in the company of these gorgeous dames-at this place, and during this time-is that it reminded me of previous years in Cairo (and earlier educational journeys), where I had entered into their cultural spaces; or had interacted (been exposed to) with women and children from their communities. My first introduction to Russia, was at Ridgeview Middle School (in North Fulton County of Georgia), and the presence of a Russian, language class. I remember a tall, blond Russian woman instructor, and her father, who was a substitute teacher. I didn’t get my opportunity to study Russian, then, but I did get it in Cairo. Three years ago, I began my Russian language studies at the Salamanca Center in Dokki. The pleasure I had in engaging in the Russian language, with my Russian woman language instructor. Ukraine had peaked my interest in college. I even recall, during one of my summer study abroad ventures, in college being told that the Ukrainian language was the hardest language in the world. Then, of course, my numerous ventures to the Cairo Opera House (in addition to my own musical engagements) put me in contact with a Ukrainian, woman violinist. The architecture of Ukrainian lands, continues to amaze me. Even having a fellow, Black American Brotha,’ friend, and colleague (who I had met through the beauty of musicianship) travel to Ukraine to work, further connected me to this land. The beautiful, South Sudanese Mother and Maiden (of my Down Time Group) returned me to the memories of childhood, and to the words of my own mother. My mother-of Black America’s gardens-who continued the legacy of her Mother and grandmother-showed me images of famed South Sudanese supermodel, Alec Wek. Presenting Alec Wek’s midnight-colored skin, and short-cropped hair, as features of Beauty, were seeds planted in my psyche. Recalling the words of my Mother and Godmother Joan Mills (from the Caribbean), on the Beauty of two, charcoal-colored, South Sudanese boys, who became students at the school where she taught, continues to paint my memory. Being interested (and passionate) about the issues happening in Darfur; and even raising money for Darfur in high school, further connected me to Sudan. That included being part of a fundraising event at Georgia State University, for the Sudan. “The Christian girl,” as Muslim women, affectionately called me, simply became one of my titles, for the Muslim community, attending the event. Then, of course, were my previous connections to Egypt. My Aunt Natalie traveled to Egypt as a participant, on one of many lecture tours, by the famed and legendary scholar, and Egyptologist, the late Dr. Asa Hilliard, III. In undergrad, I had the honor of being hand selected by famed Egyptian-Arab feminist, physician, writer, novelist, and playwright-Dr. Nawal El Sadaawi-during her 2-year professorship as Cosby Chair, at Spelman College. I was pretty much destined to come to Cairo, Egypt for my graduate studies. Mom, Dad, and Lil’ Sis’ have had their time to come and keep me company. Big Bro’ awaits his time. I look forward to future adventures with my grandparents. So, the presence of the Mother and Maiden images, as part of my own work-out fitness group, was a necessary presence. The Mother image of Cairo, reminded me of my foundation, and purpose for being in the city and country, as a whole. The Maiden image of Alexandria reminded me of the precious, family time, in that city-whose blessings of water, re-affirmed my own watery Spirit. A future time, from that point in time, would lead me back to Alexandrian waters-to the Mediterranean Sea. A photoshoot, with fellow American, Karen Flowers (award-winning photographer), gave me my first opportunity to be painted with the Sea. To be washed, and re-stored; allowing my Soul to be baptized and cleansed from these current pains of the time. This Alexandrian Maiden was precious in her movements. And, as I watched her, during that day, I observed her watery Spirit. She was fluid in her patterns of performing her maidenal duties. Capturing memories of the event, for all who attended the final training. The Egyptian-Arab mother’s Cairo presence, and wearing of the color blue, further highlighted the Alexandrian, Maiden’s duties. Each of these ladies were reflections of my own, personal footprints in Egypt’s land. They even hinted of earlier markings, prior to my initial entrance in 2010. I had entered into their gardens; their spaces of cultural womanhood. And so, they had come to visit me in mine. It was a wonderous experience, indeed. That feeling of being nourished, restored, and cared for with other healthy women. Ain’t nothin’ like it. And, it was all done during the course, of our down time over lunch. Something so simple, became so symbolic. A time so ordinary, became so enriching. So valuable. So, WOMAN-LY. We were all there. Down time Girls! Cairo, Egypt. Egypt’s Alexandrian waters. Russia. Ukraine. South Sudan. And me-Black America’s daughter. Music of my cultural garden had brought us together. And, it would ensure that we wouldn’t stay, apart. It was the perfect time. It was the right time. It was some down time, with just me. . .and the girls. 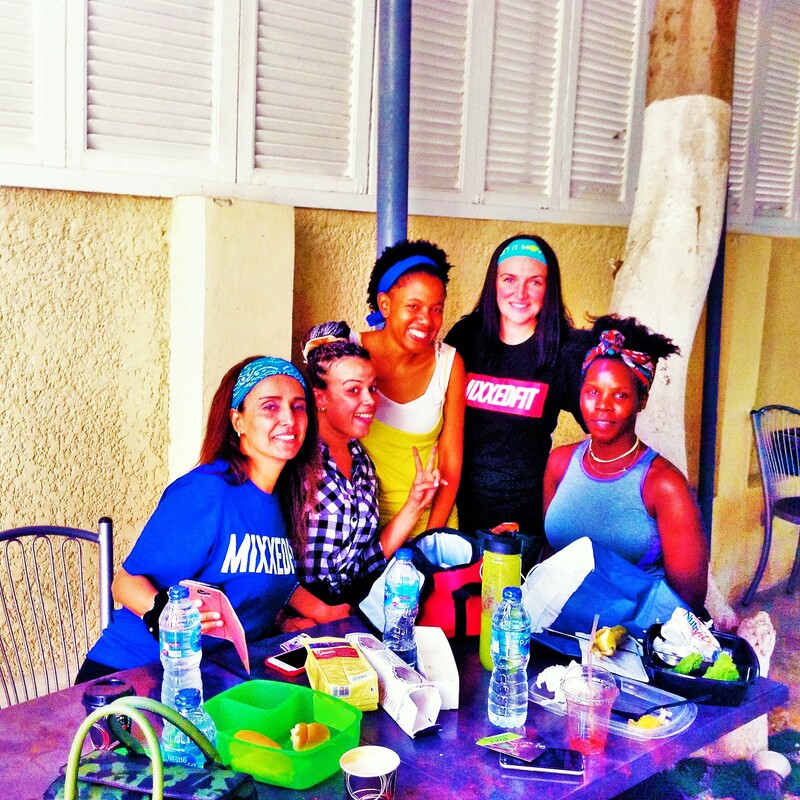 A Mixxed Kind Of Fit: The Holistic Energy of MixxedFit, Inc. to Cairo, Egypt!